June 19, 1922 ~ Oct. 2, 2017 - Her true love was babies ~ her own children, her grands and great-grands. Margaret Frances (Sonnen) Berning was born on June 19, 1922 in Portland, Oregon. She passed away peacefully in Mt. Angel at the age of 95 surrounded by family. She grew up outside of Hubbard and was the youngest of seven children. She was proud to say she lived her entire life in Oregon-and there wasn't a better place in the entire world to live. On February 10, 1942 she married Prosper Berning in Woodburn. They began their married life in the McKee area. 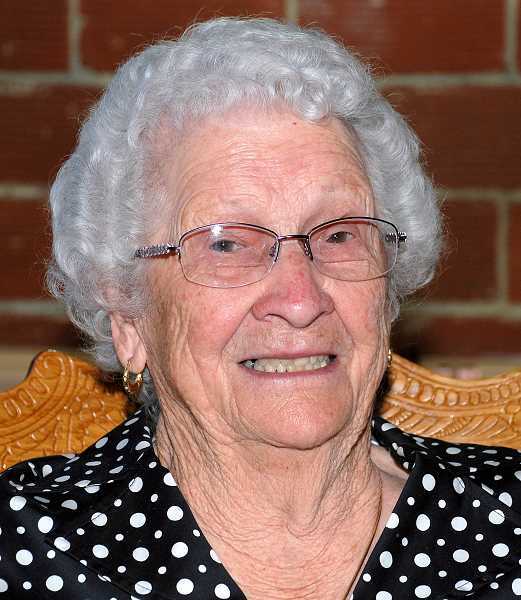 She and her husband moved to a farm outside of St. Paul in 1951 where they raised nine children. She was a great mother, a good wife, a true friend and a faith-filled servant of God. While raising her children she worked side by side with her husband on the farm. Hard work was something she embraced and she was filled with gratitude for her good fortune. Her true love was babies ~ her own children, her grands and great-grands. She never met a baby that she didn't love. In her later years she moved to the Towers in Mt. Angel where she made many new friends. She played Pinochle each week including the week before her passing. She liked to be busy and remained active until the end. She was preceded in death by her husband Prosper and her six siblings. She is survived by her nine children and their spouses, Duane, Dwight (Linda), Bob (Cheryl), Tom (Eileen), Fred, Wally, Dean, Karen Woodruff (Todd) and Kathy Schlotfeldt (Jim), 22 grandchildren, 21 great grandchildren and two on the way. A funeral Mass will be celebrated at 10:30 a.m. on Thursday, October 12, 2017, at St. Paul Catholic Church in St. Paul. The Rosary will be recited beginning at 9:45 a.m. prior to the service. In lieu of flowers, the family requests contributions be made to the Benedictine Sisters Foundation in care of the Mt. Angel Convent or to St. Paul Catholic Church.